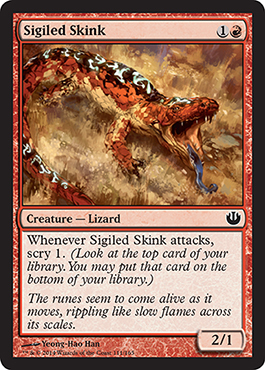 Eric's Review - Well, a creature that can become a 4/1 and only be blocked by red or artifact creatures is not bad, but probably not a card for Standard. Bottom Line: Limited seems to be where this fits. 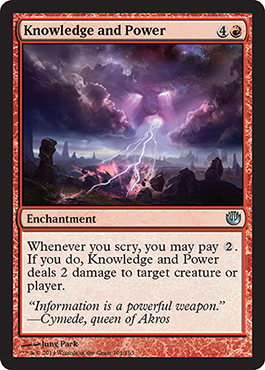 Devin's Review - Intimidate in red how wierds, though this card seems fantastic in limited. Eric's Review - The story of Atlas on a card. Kill him and everything gets destroyed. I like it! However, this is not something for Standard and probably could do something in Limited. Bottom Line: Limited and EDH, just I doubt Standard. 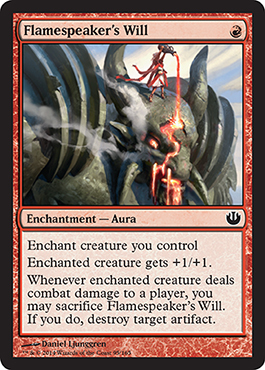 Devin's Review - Yes i would love to have a boardwipe in red for my red casual multiplayer deck. Though this guy is huge i don't think this will be good in draft but possibly in sealed. Bottom Line: Limited is where this will shine. 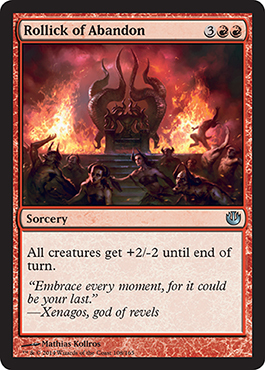 Devin's Review - More red intimidate maybe i missed the memo but i though it was not that much of a red thing, but ignoring that this card is alright maybe a shove into your limited deck. Eric's Review - I like it, just not sure what I want to do for this in a deck. I'll figure something out though. Bottom Line: Limited, Standard, Modern, EDH, don't see the downside. 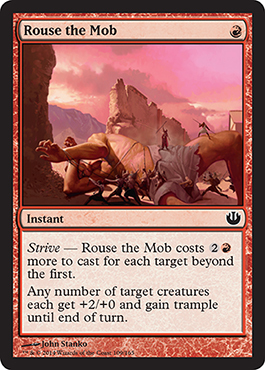 Devin's Review - Wow this is good practically evasion in red and can be used to trigger some heroic, seems great in limited. Eric's Review - This is an okay card in a Limited/EDH sort of way. I'm a big Standard player and I'm looking for good Standard cards. This definitely isn't it. Bottom Line: Limited, possibly EDH. Devin's Review - This card is alright, it just seems very mediocre in any format. If i were to play it, it would be in limited only. Bottom Line: EDH it is! 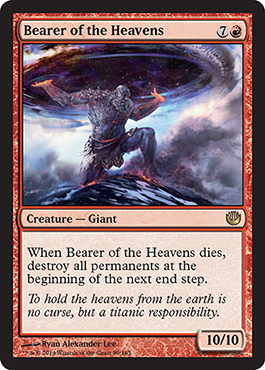 Devin's Review - I love this card for EDH, just does an absurd amount of damage in the decks that will take advantage of this card. Though not playble in standard and iffy about in limited. Eric's Review - A 2/2 for two mana is nice and everything especially with an ability, but this is really not great. It doesn't go in a burn deck, or any sort of fast deck at all. It also locks you out of casting anything small or you'll get hurt too. Overall a terrible card unless something exists to make it good that I don't know about. Bottom Line: Bad card. Doesn't really fit anywhere. Devin's Review - I don't like it, yes i know it is great for modern and legacy but i don't care about those formats and i don't care about this card. Eric's Review - If a Modern Bogles deck changes from being G/W to Naya, this would go in it mainly due to affinity being a strong deck. Bottom Line: Modern, Standard, Limited. It's all good. 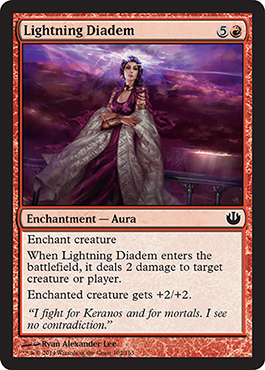 Devin's Review - Not to shabby in limited as both a heroic trigger and enchantment removal. Bottom Line: Decent in Standard, Limited, and EDH (looking at tribal specifically). Seems good. 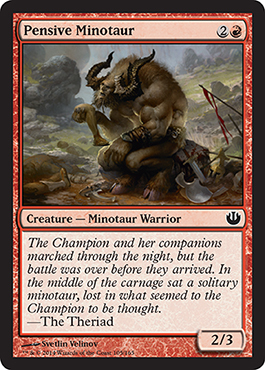 Devin's Review - 5 mana for 2 2/3 minotaurs not to bad at common for limited or in a minotaur EDH deck. Eric's Review - Well, it's not the worst and not the best from the Font cycle... But I wouldn't play it. I'd play Lava Axe first, and I don't even want to play Lava Axe. 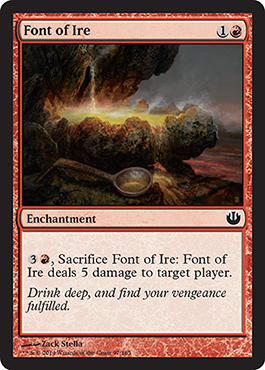 Bottom Line: It's okay for counting enchantments, but there are better spells. Devin's Review - Not to bad for limited, 6 mana for 5 damage is nothing to call home about. Though there are two things that make this card pretty good, one is that it is an enchantment and two is that you don't have to pay all 6 mana at the same time. This card is playable in limited but better in sealed than draft. Eric's Review - This might actually make Font of Ire a tad bit better. Still not great (especially when this costs four mana), but I could see the possibilities. Bottom Line: Depending on what you do with it, it could be Standard, but this is more of a Limited card. Devin's Review - aggressive base stats but kind of bad in red draft decks. 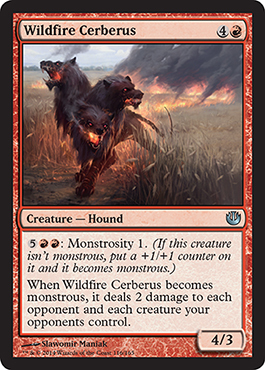 Eric's Review - Monstrous seems good as a concept, but I really haven't found a Monstrous card I like (except Fleecemane Lion) because setting off Monstrous doesn't work so well or costs too much. 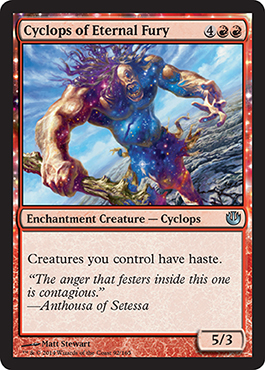 The only benefit for this guy is you can set him off the turn after you cast him, but still, an 8/7 for thirteen mana? Terrible. Bottom Line: Limited I guess? Devin's Review - Bad card, but great art. 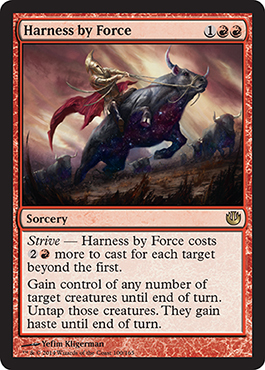 Eric's Review - After reviewing Blue, I can't see Strive without thinking "Battlefield Thaurmaturge would make this much better" so I can imagine a world where I steal three creatures for just five mana (initial cost plus two reduced to one R each through two Thaurmaturges). Bottom Line: I can see this work well in Standard. I want to see this work well in Standard. I will make this work well in Standard. Devin's Review - It's an act of treason with strive that i think is a horrible waste of a rare spot. Though it will be good in sealed and EDH. Bottom Line: EDH, maybe Limited. Devin's Review - Yeah boost for a draft deck, that nobody plays to begin with. While it will be good in R/U scry nobody plays it so it is useless. Eric's Review - If only this cost less. This might be better at 3 or 4 mana, but 6 is a bit much, especially when the ETB triggers only once. Bottom Line: Not so great. I was about to switch my Modern deck to Naya Bogles, but then I saw the casting cost and thought better of it. Devin's Review - To much mana, but a really good effect that would be playable if it cost one mana less. Eric's Review - A directed Pillar of Flame. I'm not that impressed. 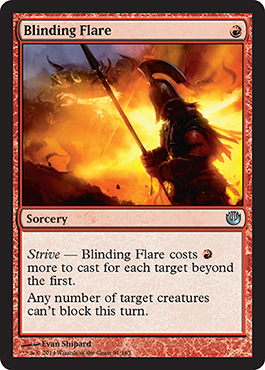 When I play burn, I want everything to be able to hit my opponent directly (Searing Blood does it indirectly, but my opponent still gets hit). Bottom Line: Not so great, but Limited could use it. Bottom Line: I like it. Good Standard material. 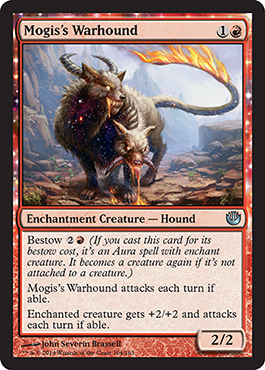 Devin's Review - Ah good old fashion Doge's Warhound, Very red, much aggressive, so playable. 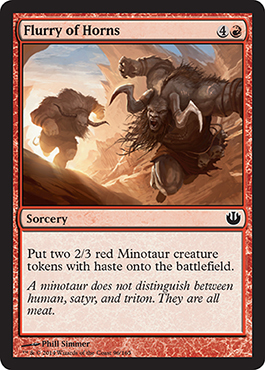 Eric's Review - It isn't too bad compared to other Minotaurs since most cost two to three mana and are 2/3 creatures. Seems good. 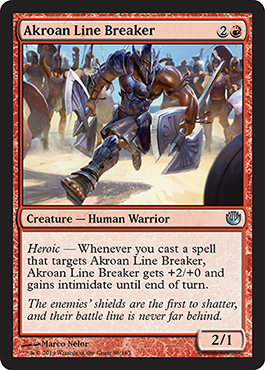 Bottom Line: Standard or EDH Minotaur Tribal. Limited works too. 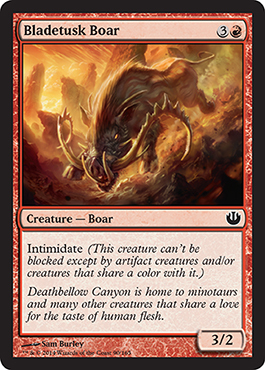 Devin's Review - Love the flavor text and art of this card, though it is alright when compared to other minotaurs. 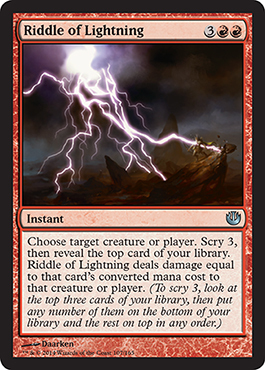 Eric's Review - This will probably not make a big splash in any format (although powerful in Limited), but if you drop enchantments, the double strike and trample could work well for you. Bottom Line: Standard is a possibility, Limited is more likely. Devin's Review - This card is just alright, i mean it is fantastic in limited and will see standard play, but it is very underwhelming. Eric's Review - Bit risky and costly, but it could be interesting. Bottom Line: Limited most likely. EDH could make this pretty good too. Devin's Review - Could be great, could be horrible in this limited format though i am going in between and saying good. This card adds plenty of knowledge and has the possibility for a lot of damage. Eric's Review - And this is the embodiment of the Red we all know and love. 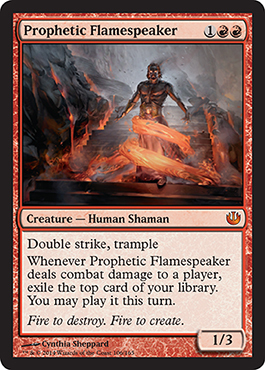 This also could make a nice boost to Prophetic Flamespeaker. 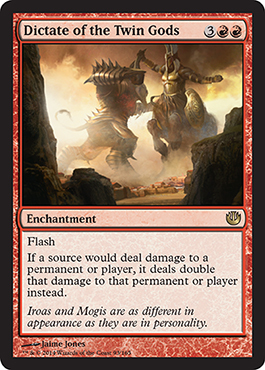 Bottom Line: EDH most likely, Standard is a possibility, Limited will probably use this. Devin's Review - Very chaotic and red, though it is pretty bad when trying to play seriously in limited. Eric's Review - This also makes Prophetic Flamespeaker better. Bottom Line: Standard and Limited would be awesome for this, especially considering the ability. Devin's Review - wow! Triggers heroic pumps my guys and gives trample, just amazing. That is all with out the late game strive for more sweet value. 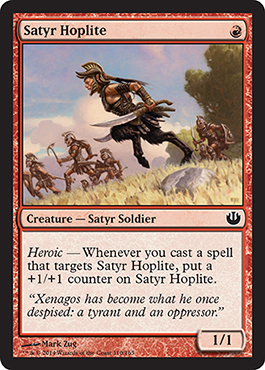 Eric's Review - Basic red hoplite. Seems good. Bottom Line: Standard for sure! Devin's Review - So good and just what the R/W heroes deck wants a one drop heroic card that is playable. 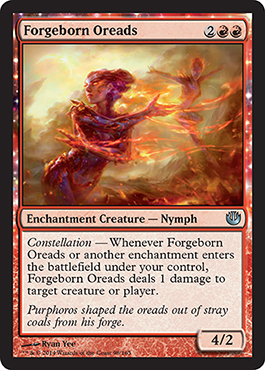 Great in limited and have seen some red aggro decks in standard toy with it. Eric's Review - This seems decent. A 2/1 for two mana that allows you to scry when it attacks, not when it deals damage. Bottom Line: Limited definitely, Standard maybe. 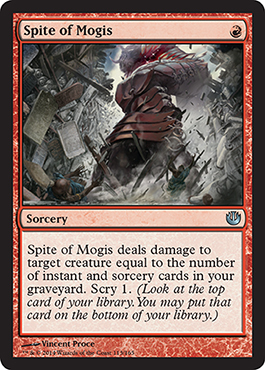 Devin's Review - Just some more red aggro for limited, not that good unless you just want to do cheap aggro so play wisely. Eric's Review - And this is an EDH deck or mono red deck if I ever saw it. Bottom Line: Maybe Standard, but otherwise EDH. 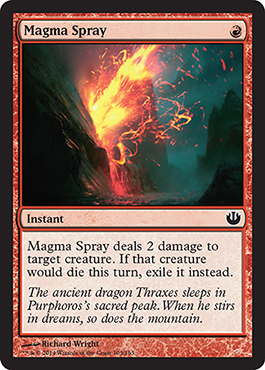 Devin's Review - This is so bad, i would love this card when just learning magic, but now it is very bad. Though as to counteract my own statement this is pretty good in sealed. 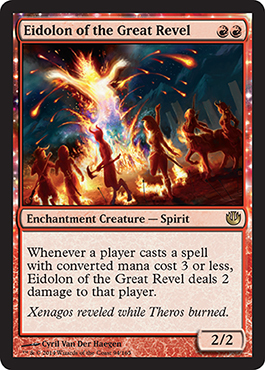 Eric's Review - This seems pretty good in a burn deck, AND you get to scry. I like it. 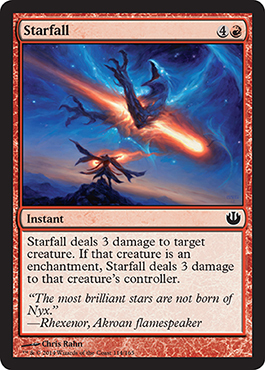 Bottom Line: Standard, maybe Limited, and it has a place in my Modern burn deck. Devin's Review - This could do a lot damage, but it could whiff more often then it won't so not worth drafting unless you are drafting the R/U scry deck. Eric's Review - So a potential to deal six damage for five mana. Honestly this isn't so great. I do want one of these in foil though. Bottom Line: Limited most likely. I don't see it being used elsewhere. Devin's Review - This cards art is pretty but it's ability is not. 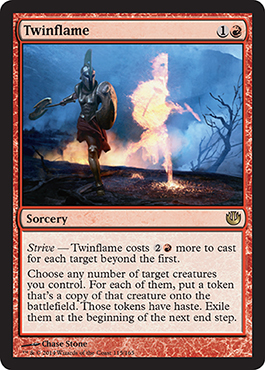 Eric's Review - A better Splinter Twin maybe? I've never played a deck like that, but it seems being freed from the Enchantment and tap requirement could make things better for you. Bottom Line: Standard definitely, Limited possibly, and this might show up in Modern too. 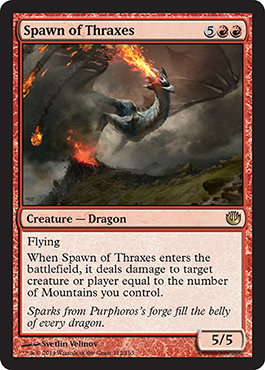 Devin's Review - I like this card and could find so many ways to manipulate this card with enter the battlefield effects in EDH. Great in limited though i don't think it is playable in standard. Eric's Review - The Monstrous ability is good, but a 4/3 for five mana is a bit much. Probably more of a limited thing. Bottom Line: Limited, maybe EDH. Devin's Review - I forgot R/G monsters was a deck in limited and this card makes me want to play it.